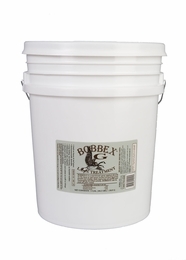 Bobbex-G is a special formulation designed to supplement the applications of Nitrogen, Phosphorus, Potassium, and other fertilizers. The lawn treatment is applied directly to lawns leaving a lasting residue, which geese avoid. Bobbex-G will prevent damage and fouling of grasses and lawns by grazing geese. Bobbex-G will not wash off with rain, hosing, or irrigation. It is readily diluted in water. Mix with water into a pressurized sprayer, will make up to 50 gallons of mixture.